This crispy Paleo Pizza crust will remind you of your wheat based favorite! 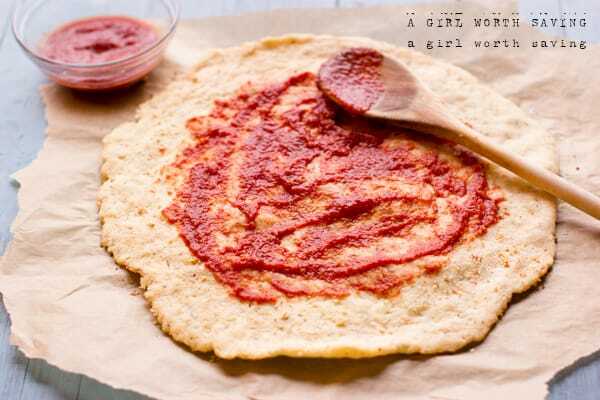 This paleo pizza dough is dairy-free! I’ve been tinkering around in my kitchen with Tapioca Flour and, while it walks the line between Paleo and not-Paleo, it truly is an amazing flour to add to your grain-free pantry. 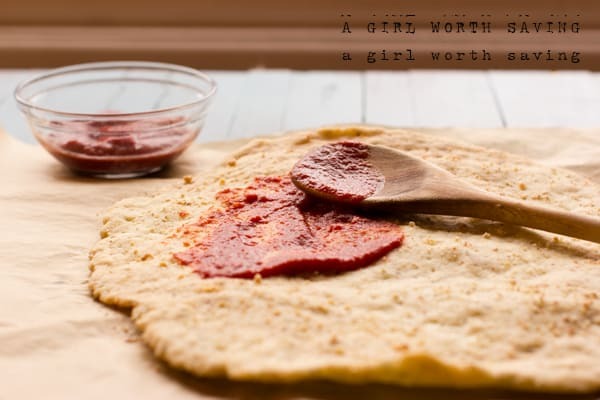 I’ve made bread and fritters with it in the past but I wanted to see if I could make a Paleo pizza crust that was reminiscent of the thin crust pizzas that my husband loves. Mr. Bejelly pronounced it the best crust I have ever made to date so I take that as high praise from his picky self. You can make this really thin and it will be super crispy and firm or make it more doughy and soft. For a crispy crust keep the thickness at 1/4″ to 1/2″. Anything larger than this and you will have a soft crust. 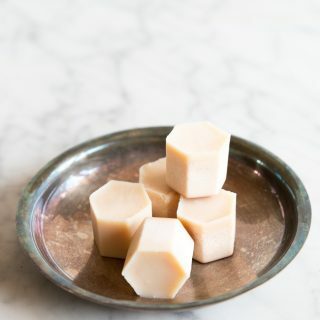 This recipe is super simple and dairy-free. Can I substitute arrowroot or cassava flour for the tapioca? You cannot substitute the flour in this recipe and I highly recommend you use Bob’s Red Mill Tapioca flour for the best chance of success. 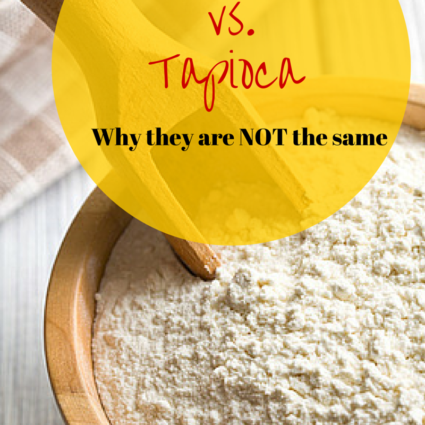 For more information about why tapioca flour and arrowroot are different read this post. Can I use flaxseed or aquafaba to make this egg-free? I’m having trouble getting the pizza dough come together, what can I do to save the recipe? First, make sure you are mixing together the ingredients when the flour is very warm. Next, you and try to put it in a food processor or kitchen stand mixer to beat the dough together. Can I bake this on a pizza stone? Yes you can. Just keep an eye on the crust as it will cook faster. What paleo pizza toppings do you suggest? Crispy just like you remember pizza crust should be! In a small pan add your olive oil, water, sea salt and garlic and bring to a boil. Remove from the stove and add in your Tapioca flour and mix. Let this sit for 2 minutes and then work in your Italian seasoning and egg. The dough should be warm, soft and pliable and not sticky. If it's sticky please add more flour. Here you can either shape into bread rolls or take two sheets of parchment paper and roll/flatten out the dough into a pizza dough. For a crispy crust keep the thickness at 1/4" to 1/2". Anything larger than this and you will have a soft crust. Remove the top piece of parchment paper and sprinkle the top of the dough with 1 tsp of almond flour. Bake at 350 for 25 minutes on a stainless steel baking sheet. When the crust is done you can top with your topping and cook until warm - roughly 10 minutes more at 350.
thanks Kelly, I’m keeping this one. I hate to have to get rid of pizza. We get one with carmelized onions and prosciutto that is to die for. I want it. Maryann it’s super easy and yummy. The first crust that I have ever made the reminded both me and hubs of a “normal” crust. What can I substitute for almond flour? Kelly, this recipe sounds great and it’s similar to your garlic bread that I made the other day, which was yummy but my concern is about bringing the oilive oil to boil. Olive oil oxides at high heat so wouldn’t this be unhealthy???? Hi Astrid, you can use coconut oil or palm shortening as a replacement. I use palm shortening all the time. PLEASE don’t use PALM OIL or PALM SHORTENING, Kelley Bejelly!! Hi Sam, Thanks for sharing your concern. I would also look into the standards that Tropical Traditions uses when harvesting palm. I come from south of france and we have mediteraen diet, we cook everything in olive oil, and our general way of eating is recognised to have many benefits for your body, and increase life length so you make your decision. If you ever find the time or interest I let you read this article, you can fry stuff in olive oil,, and olive oil has lot of health benefits. Kelly, the recipe calls for 2 Tbsp of Almond Flour, but I only see 1 tsp used in the directions to dust the top of the crust. Can you clarify? Thank you. It’s 1 teaspoon hun! I just updated it. OMG! This crust is awesome! Super easy to make too! I made two batches to freeze for later. Thank you Kelly! Holy crap thank you!! Finally a real pizza!! I wish you were in front of me I’d hug you!!! Delicious!! So glad you enjoyed it hun! I’ve never made my own dough. I need to try it! Is this gluten free? I should try it out. Is tapioca flour and tapioca starch the same thing? Looks really good! We love pizza so I may try this for our next pizza/movie night. Oh my yum!! Thank you for sharing! Dairy-free? I’ll have to try to make it for my DD! I have never tried almond flour before. OOH! I love this! I needed a better pizza dough recipe without all that flour! Pizza is my one weakness, thanks for this recipe! I’ve done quite a bit of gluten free baking, but Paleo is incredibly tough. I had a lot of problems with coconut flour and tapioca flour at first but now I have an idea of the ratio that they need to be at to work. It took me a while to get it down. Yay that you don’t have to give up pizza! Thanks for the recipe, I can’t wait to try it out! One question though, how large of a pizza does this make? I’ll be making this for 6 hungry people, so I’m trying to figure out if I need to double the recipe. Actally I was able to make the pizza and make 3 extra rolls with the recipe. My pizza was 10″ round and thin crust so really crispy. You could easily make a 12″/14″ pizza with this. Yum! I’ve never seen that type of flour before. Can you buy it at a regular grocery store? I get it at my grocery store in the natural section. Bob’s Red Mill makes it. I’d never heard of that before but wow, it looks like it bakes up perfectly! As a NYer I love Pizza. And why not try to make a healthier one. I am in! I love pizza, definitely a recipe to try. I haven’t had pizza in over a month. I miss it so much. Too bad there isn’t a low carb, fat free version out there that actually tastes good! This looks good. I love that it doesn’t take all night to rise! I love these photos! I’m totally craving a pizza right now–that crust looks so crispy and perfect! I totally want to try this. I have been making pizzas quite often lately and would love to change up my crust. I’ve made a coconut flour pizza crust but not tapioca yet. This one sounds great and less dense than my first attempt! Wow, FINALLY! I’ve probably tried 10 different paleo crusts and they are all terrible. This one actually tastes like the real thing!! THANKS!! You’re a hero! I hope you’ll contribute this recipe to this month’s Shine Supper Club. We’re celebrating healthy recipes, and this would be a perfect contribution! Aw, Thank you. I’ll check it out. Does chickpea flour count as non-grain? It’s a legume hun so while it works for a grain-free diet, it doesn’t work for a paleo diet. This is a great recipe! Thanks for sharing it. I might to make this over the weekend as we love pizza! Thanks! I could kiss you right now! Thanks! I’m talking about the tapioca pizza crust. Yes, that should not make a difference. I hope you enjoy it! I just started Paleo and this seems like A LOT of olive oil. Is this a normal amount of oil to cook with on Paleo? You could sub it with Coconut oil? Are you concerned about the fat? I follow more of a Primal diet which has more of an emphasis of fat as a food group. I know that Loren Cordain at first pushed low fat on the Paleo diet however in the 2002 revision of his book he was more accepting of saturated fats. I made this today in the form of mini pizzas with the intent of sending them in his lunch to preschool. I then had to go to the store to buy more ingredients because we ate them all. I have since made another batch and its killing me not to eat one. I loved the first one, it was crunchy, yet soft and airy. The second batch, I actually did 1 cup tapioca, 1/2 cup coconut flour and I did use less olive oil. They turned out FANTASTIC. taste the same as before, just a little more dense because of the coconut flour. THANK YOU!! I tried the original recipe and LOVED it! It’s a super easy and tasty recipe. The second time I made the crust, we were out of olive oil so I used coconut oil as a substitute. It tasted fine, but was much harder to work with and a lot of the oil baked out of the crust. It was messy and the crust was a little drier, but still amazing. Anyway, just thought I’d give my feedback. Thanks for such a great recipe! Thanks Cara and I really appreciate you letting me know that coconut oil is not the best substitute to use. What’s the right amount of almond flour? Thanks for catching that Luiz! It should be 2 tsp of almond flour. Thank you for sharing your recipe. We tried it twice…we knew we made a mistake the first time…but the second time it came out great. Very tasty! I really really like this recipe! I’ve tried a variety of paleo pizza crusts and they always turn out mushy. This recipe gave the most crunchy, crust-like result. HOWEVER, 1/2 cup of olive oil was wayyyy too much. I ended up with a dripping heap of dough that I literally squeezed oil out of, and into the sink. Even after squeezing out excess oil the pizza still baked in a puddle of oil. It resulted in crunchy edges but a soggy center. LI will definitely try this recipe again but with much less olive oil. THANKS FOR THE REECIPE! Without the garlic and Italian seasoning, could this be made into tortillas? Or do you have a tortilla recipe? I’m working on a tortilla recipe but that doesn’t help you right now. This would not work as a tortilla. It gets too crsipy and if you didn’t cook it as long as the recipe states, it would be very soggy. I’m sorry hun but I should have my tortilla recipe down shortly and I’ll email ya! You are so welcome! It’s a favorite in our house and we eat it 3x a month! THANK YOU!!!! Pinned and going to try it sometime this week! It’s seriously one of our favorites and sometimes I make it 2x a week – yeah, I know but it’s so good! I hope you like it 🙂 Watch the video if you need help. I do the same thing and it comes out perfect 🙂 I’m so glad you enjoyed it. I kind of gave up on ever enjoying pizza again since I became strictly gluten and dairy free, plus mostly grain free. 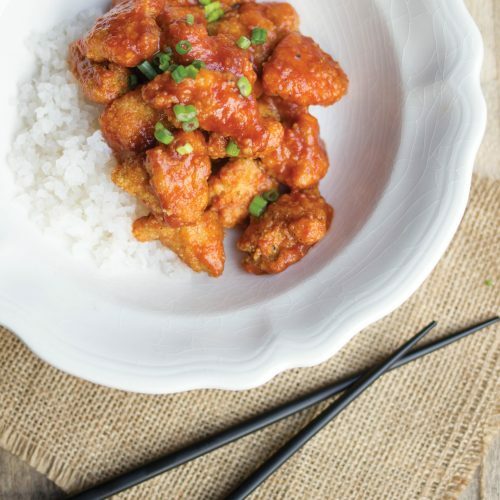 But I was craving it tonight so I tried this recipe and it more than hit the spot! My husband is still a gluten & dairy eater and he even said this pizza blows Papa Murphy’s out of the water! Not that Papa Murphy’s is anything to write home about, but for a guy who is used to cheesy gluteny pizza to PREFER grain-free, dairy-free pizza seems like a big deal to me! It probably helped that I put bacon on as one of the toppings! Thanks so much, Kelly, for sharing this! Yeah! i’m so glad you both loved it and ha, I had my share of Papa Murphys so thanks for the giggle. I made this pizza last night. The first time I tried to roll it out it was too wet and stuck to the parchment paper so I had to scrape it all off and add more tapioca flour until I could actually handle it without it sticking to my hands. I also added almond flour in the mix about 2 T. When I baked it I flipped it several times and finally removed the parchment paper once the crust was crisp and a solid piece. I baked it for probably 40 minutes before I put anything on it to make sure it was crispy and browned. After adding toppings I baked it even more and I used 400 degrees for the final baking, probably could have started with a higher temp to make it quicker. Now, after all of that I will say that the crust was really good, crunchy with nice texture – it is the best pale crust I have ever had and I am done searching, this is the one!! I’m so glad it worked for you Julie and thanks for sharing those tips! Would it be possible to substitute the tapioca for arrowroot? Yes, a lot of people have done this with success. Just remember to check out the how to video! OK, I’ve made pizza crust for ten years now, so I though I’d try this new paleo fad crust. I was able to use tapioca flour, and it followed the direction to a tee. It came out the same way. Horrible. paleo. Good luck to those that got it to work. Sorry it didn’t work out for you. Tapioca flour is truly hard to work with. Also, wheat is a grain so it’s not Paleo. It’s amazing how much difference cooking the tapioca flour first makes. I’ve bought an entire box of Chebe pizza crust mix (modified tapioca starch) and have only made it once with so so results. I tried your method and it came out delicious. Omitted the garlic and spices since it’s already included in the mix. Thanks for the great recipe. I’m so glad it worked for you Erika! I made this tonight and the amount of EVOO was way too much. I held the dough between the parchment paper and poured the excess in the sink. Then I used paper towels to soak up additional oil. This seemed to do the trick and the dough came out of the oven just fine and tasted great. I opted to go for a thicker softer crust and it was perfect. I’ll definitely make this again and just use less oil. My hubby gave it two thumbs up as well! Can this dough be made and then frozen to have on hand to thaw and bake? I work 12hr days with a 40″ drive each way and think it’d be great to come home to ready to bake quickly. I had a reader recently share she was able to make a pizza with toppings and cut it into serving and then reheat it when she wanted to enjoy a slice 🙂 I hope you enjoy it! Sorry to say but this turned out to be mess for me. I followed your recipe and method exactly and the parchment paper completely pulled off the Pisa mix that I couldn’t even add almond flour on each side as I kept having to re mix and roll the dough. I finally gave up and put the almond flour in the mix and spread it on a tray and it is now in the oven. I am not hopeful. This was far from easy and my kitchen is a mess! Sorry it didn’t work hun! This was awesome, my son loved it – I doubled it to make a large pizza w/a thick, doughy crust for him & used Kerrygold butter + a little palm shortening & substituted 1 tbs of gelatin, 1/4 cup mashed plantain & 3 tbs Heather’s Tummy Care Fiber for the egg, which worked great. I used a big handful of dried basil, to soak up some of the oil & make it taste phenomenal. My only issue is there is too much oil in this recipe. I will cut it down by 25% next time. The crust was sodden with oil, squish, squish. I will comment after this modification. Anyway, thank you for a great, simple, and pretty darn cheap recipe! I’m so glad it worked for you and I hope that reducing the oil helps! Ok, so reducing the oil was not good! LOL! My son was like, “See Mom, why don’t you listen to my ideas!! !” He’s 12, LOL. Reducing the oil left it unhappily dried out, and not in a fun, crispy way. In a hurt-your-teeth way! So, I decided to try a trick I usually do when recipes call for honey/agave nectar (whole milk yogurt + stevia), but without the sweetness. I replaced the entire amount of oil with whole milk yogurt, then worked with & added a little flour it until it was doughy but still a tiny bit sticky, then added about a tablespoon of olive oil, which coated it and allowed it to stretch out over the pan. I’m not sure what true-Paleo substitute one could use for this, but we do fermented dairy. Oh, I also brushed the dough with olive oil prior to cooking & had to poke holes in it with an oily knife so it didn’t balloon up. This worked great! I double the recipe for a large pizza because my son likes a doughy crust – I will try a small, thin one for myself later this week. Thank you again for providing this recipe! It’s awesome, especially for people allergic to grains/legumes/potatoes LOL Like myself. I worried it was not going to turn out well, so I went back and read more of the comments which I should have done the first time. I decided since I had enough flour, I’d make a 2nd crust using red palm oil instead and add more tapioca flour, if needed. I found there was a definite difference in using palm oil vs olive oil. The dough with EVOO was literally dripping and the palm oil dough was not, even though the measurements were the same. But it was still too wet. I added more flour to the dough in 1/4 c increments. I did not track exactly how much more I needed to add in to affect the consistency, but I know I added at least another 1/2 c of tapioca flour. What I was looking for was a dough that reminded me of regular pizza dough and stayed together like regular dough. The first batch was stringy and clumped in wet chunks. The 2nd batch using the palm oil stayed together better but was too wet. After adding the extra flour, it was more doughy like I would expect. It was stickier than some kinds of dough, but not sopping wet. The video really helped me here to see how the dough consistency should look and I was able to make adjustments until I got something that looked similar. The first batch with EVOO came out of the oven and there was 1/2 inch pool of oil around the crust. I expected the crust to be soggy, but it actually crisped a lot. I rushed off to fan my overly sensitive smoke detector and came back to find the crust had absorbed all of the oil back into itself. There was virtually no visible pooling oil. I broke off a piece and this crust is crunchy, but not rock hard as some crusts I have tried. It was very tasty, but was not what I envision as a pizza crust. I also found it a bit salty. Some might find it has taste that is too greasy, kind of like something deep-fried. I think it reminded me of a type of cracker or maybe if the savory herbs and salt were removed it could actually be used as a pie crust. My husband thought it could be a crouton substitute. I could pick up the whole thing in one piece, it was that crispy. Pulled out the 2nd crust made with palm oil plus extra flour and wow! It had a delicate crispness on the outside, but it was soft and airy on the inside. It was exactly what I would envision a pizza crust being. Perfect texture! One thing I would change about it is since I had to use more flour, it diluted the crust flavor and made it taste rather bland, so I would add more salt and seasonings. I also wonder what would happen if I added another egg? The other issue I had with the 2nd crust is when I was trying to spread it out, it kept separating and leaving holes. As I covered up one hole, another one popped up. Even though all the holes were covered up when I put it in the oven, they eventually separated again while baking and the finished crust has holes in it. Guess I’ll have to tweak and figure out what needs to happen to keep the holes from happening. 🙂 This crust was not as crunchy as the first so I would not be able to pick it up without it falling apart. After adding toppings, we did find the very middle slightly soggy, but nothing terrible. I may have also pulled the crust out a few minutes early because I was getting impatient and that could have some bearing on the middle not crisping up as much. * I accidentally turned the oven to 450. Maybe it caused the 1st batch to get too hot and the oil to draw out of it too quickly and caused it to have more of a deep fried crust effect. But, the 2nd batch with palm oil and more flour was just fine at 450. It was actually the perfect texture. * I live at approximately 1100 ft above sea level. * I used heavy stainless steel jelly roll pan and silicone baking mats. There was so much oil in the first batch that seeped out, a pan with a rim to contain any oil would be important. * I used Nutiva red palm oil instead of regular palm oil. From the research I did, it doesn’t seem that cooking/baking would be affected much by red vs regular palm oil. The red is just less refined and supposedly contains more vitamins/nutrients in it. It may have a slightly different taste, but probably nothing too noticeable. My crust was rather bland, so it wasn’t anything I noticed. However, since it’s a reddish color, it makes everything it touches, including the crust, an orange color. * I did not use the almond four/meal at all. I might use it next time and see if it changes the flavor/texture. Hope that helps someone make any necessary adjustments. It’s the first crust I’ve tried that is grain and dairy free that tastes good and has good texture, not chewy, not rock hard, not doughy or soggy. Just right!. You can leave off the almond flour if you need to be nut free. It would be interesting to know if using an egg substituted would work, too. Thank you so much for you thorough comment of the process you took to make this recipe. I know it will help other people. The oil being absorbed back into the dough is exactly what I’ve experienced! I halved the recipe, all except for the egg, since I’m just cooking for myself. I used regular unsalted butter instead of olive oil. Then I made 3 small personal-size pizzas, and just spread out the dough with my hands (using the almond meal sprinkled on each) rather than rolling with parchment paper. I baked exactly as you said, and they turned out GREAT. The flavor was spot-on, and the texture was a really good thin crust pizza texture. Also, just had to share what I found to be a really good pizza combination: I found a good low sugar bbq sauce and spread a bit of that on each pizza crust. Added some leftover roasted, shredded chicken (combo of white and dark meat). Then topped with a little organic mozzarella, since I can do some occasional organic dairy. I baked that as per your directions for about 10 min, and it turned out perfectly. Delicious BBQ Chicken Pizza! Actually, I forgot to say that I used arrowroot flour instead of tapioca starch, since that’s what I had on hand. Thanks so much for you comment Carol. I had to giggle a bit when I read it but I’m so glad that it turned out well for you. Yeah 🙂 I’m so glad you enjoyed it Kristen! Can you substitute the egg with anything? Some people have used egg substitutes successfully in this recipe hun. This looks really good! I could live on pizza and have had trouble finding a good healthy replica of the real thing. I’m excited to try this!! Any chance you might know how I can use my thermomix to make this dough? Hi Trish, I have never used a thermomix so unfortunately I am no help. I hope you enjoy it! Hi Theresa, I have tried the Chebe mixes and for some odd reason they give me heartburn. You should have no probably making this with an egg replaced. Tapioca flour works wonderfully with them. I’m so glad you posted this recipe. I was looking to make something gluten free that wasn’t like cardboard. I just made it. I just had a little taste from my sons and it seems divine. Mine is in the oven as we speak and I have no idea if I can wait!!! It’s that good and it was very easy to make. Im def sold on this crust. I think it will be my new go to recipe. Thanks a bunch!!!! I hope you enjoyed it Laura and thanks for the conversions! It was lovely, I enjoyed it for two days in a row. I just think there was a bit too much fat in the crust, especially at the ends that were without sauce and/ or toppings. It had a slightly greasy aftertaste, so I think I’m gonna replace a part of the oil for water. But thanks! I am blown away by this recipe! So good. Both of my kids love it and that’s a hard thing to accomplish. Thanks so much Michelle! I love your photography style! Can this pizza dough be frozen to be used later? Bonny, I would prebake it and the freeze it. Does that make sense? I’ve just tried making this paleo crush and realized that my dough could not mix together well..
Hi Fani! I’m not sure what went wrong to be honest. I have never seen this look like shredded coconut. Perhaps the wrong flour? I hope you don’t mind me translating this recipe to norwegian on my blog., with metric measures. I will link to your blog. This Pizza crust is AMAZEBALLS! One word: AMAZING!!! This recipe was the best. My husband and I both enjoyed it so much. I did not need to make any changes at all. I did place the dough in a round baking pan to get the “pizza feel” This recipe is so great that I am going to make it again tonight but triple it so we can have more! I love the crispiness of the crust. Thank you! I cannot wait to try the other recipes. Yeah! I’m so glad it worked for you Melissa 🙂 Happy eating hun! Have you checked out the nutritional values for tapioca flour? You might want to sit down first because anyone watching their carbs are going to have a fit. 26 carbs per 1/4 cup. Hoooow much tapioca flour is in this? Yes, this is NOT low carb and makes for a great treat every now and then. Kelly BeJelly- If that is your real name?? If it is, awesome. if not, even better. Amazing Amazing Amazing. I can’t thank you enough for this recipe. I’m embarrassed by and POed at the haters(whom you handled so well) out there who either can’t follow a recipe, can’t modify on the fly or completely change it and complain that it’s not right. Eli “svelt flour” should be taken out back and beaten with a pizza peel. I tried a bunch of other paleo doughs and most were inedible–I actually threw a pizza away once. But this one–So good. So freakin’ amazingly good. OOOOOOHHH the warm olive oil in a crispy crust and soft middle— fantastic. I even made burger rolls and served up to a couple of friends who loved ’em too. I was wondering if butter would work instead of olive oil? I did not find this to be nearly as easy as was implied. I probably added an additional cup of various flours in an attempt to get something that resembled dough. The end result tasted good, but my patience was gone and my kitchen was trashed. I’m not sure where I went wrong, as there are so many glowing reviews. I wish it had worked out better! Hi Aleda, if you look in the post there is a warning about the difficulty some have with this recipe. I’m sorry it didn’t work out for you hun. Thank you Hazel! I’m so glad you enjoyed it hun! Also, congrats on your weight loss and I wish you the best on your health journey. 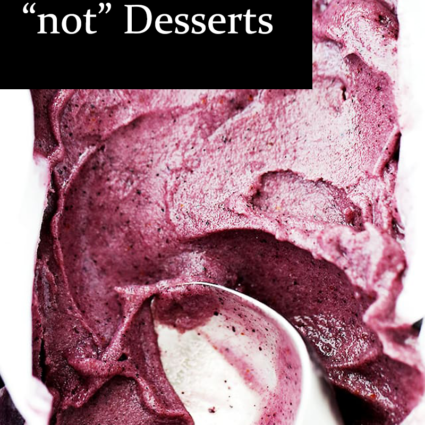 You mention almond flour- only a little- in the recipe, but I dont see you adding it in the written recipe nor on the video tutorial- is is unimportant? Hi Ashley, it’s in step 6 hun. Can I add a little yeast just for the flavor? I don’t see how that would hurt hun. I’m eager to try this recipe, but in the description of the two starches you wrote that they should be mixed with cold liquid to prevent clumping. This recipe says to add the starch to the boiled liquid mixture… Does it not clump? OMG!!! That was the best crust I have ever had, paleo or not. We love crunchy crust pizza but hadn’t found one this good until now. Your recipe was easy to make (thanks for video too, it made it even easier). I have been on a paleo diet since March and have been craving pizza…my husband too. Found your recipe online and with all the great reviews had to give it a try. I made two so we would have leftovers. My husband (who is not on paleo diet) said “that was an awesome pizza…I would give it two and a half thumbs up! !” Thank you, thank you, thank you! Yeah! I’m so glad you both enjoyed it Kim! I seriously cannot find the amount of cauliflower in the ingredients listing. Also, the video link isn’t working. I would LOVE to make this!!! I just updated the video link hun. THere is no cauliflower in this recipe! Hi, I made pizza tonight and used your crust recipe. It was really good, thank you! The center was a little chewy, maybe too much olive oil, but I still really liked it and would make it again! I think I’d try less olive oil? But I still really liked it either way. Thank you! Yes, you can reduce the oil by 2 tablespoons hun. I read a lot of comments that said the tapioca was stringy and difficult to spread and here was my solution. After I added the tapioca to the hot water and stirred I put it in a food processor and ground up the mixture. Then I added the egg and pulsed the processor. Sometimes the dough is a bit sticky so I add a little more flour. And wow it becomes the consistency of regular dough and is very easy to spread or make into rolls. I also do this with your cinnamon roll recipe. Thanks for the great recipes! Pizza night is back! This is by far the best paleo pizza crust I’ve ever had. Have you ever tried coconut oil instead of the EVOO of Palm oil? Yes, I have. It does work hun. BEST pizza crust ever!!! I even think it surpasses the usual wheat pizza dough with which I have had varying successes! This recipe came out perfectly crispy and tasty the very first time. I did find I needed to add a bit more tapioca flour which didn’t hurt. My husband declared it “a winner”! Thanks Kelly!!!!! Yeah! SO glad you both enjoyed it! I’m happy it worked for you hun! Will arrowroot flour/starch work instead of tapioca? Thank you! My family has been on the Bulletproof diet (gluten free, sugar free, yeast free, organic) for about a year and haven’t had pizza for about a year until we stumbled across your blog. This is now one of our weekend treats on days we are upping starches. Have you ever tried substituting the olive oil for avocado oil? I might give that a go next time as it deals better with heat (I believe) than olive oil. Again, thank you!! I tried to make this dough. I followed the recipe exactly. I ended up adding twice the flour and it was still a sticky mess. This wasted my time, energy, and money. I am now hungry and angry. I have multiple allergies and have yet to find a recipe to suit for pizza base. Haven’t tried Tapioca flour as yet and would have to leave almond flour out and substitute Olive oil for sunflower but all looking good. Thank you so much. Made this tonight. Been on paleo diet for 3 weeks now per doc orders and have not been able to have the basic things I take for granted, like pizza. At first I was not crazy about the texture but once it had set it actually got better. The outer crust was crispy, the inner pie was chewy with good texture. I think the only thing I would possibly add would be some sort of yeast to have that nice yeasty bread flavor. Well done. Good tasting crust..new to paleo and love this one best so far! Is there anyway to make the dough to use at a later date or does it have to be rolled out immediately? Thanks! You could par bake it and then warm it up later hon. I would recommend that.